(CNN) - Almost 28 years after it was launched, NASA's intrepid Hubble Space Telescope just keeps illuminating distant reaches of the universe. 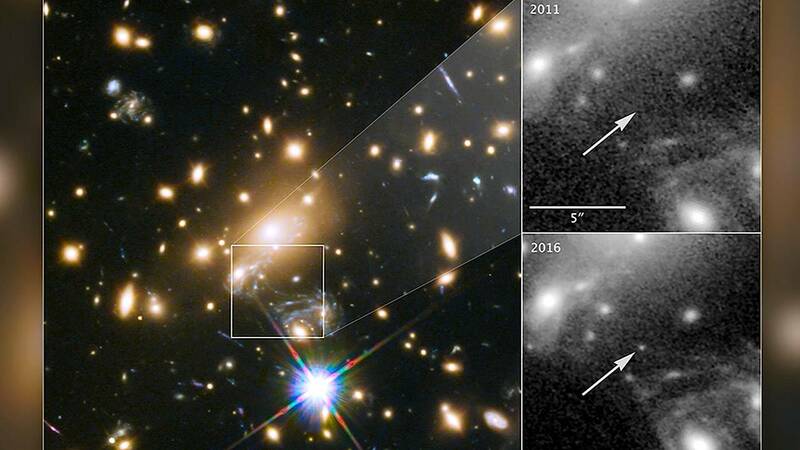 Thanks to a phenomenon called gravitational lensing, Hubble has helped astronomers set an out-of-this-world record by spotting the farthest individual star ever seen. The massive blue star, located in a remote spiral galaxy, has the catchy official name of MACS J1149+2223 Lensed Star-1. Luckily for us, scientists have given it a nickname: Icarus, after the character from Greek mythology who flew too close to the sun. What's most interesting about this discovery is that it is a single star, said lead researcher Patrick Kelly, an assistant professor of physics and astronomy at the University of Minnesota-Twin Cities. "This is the first time we're seeing a magnified, individual star," Kelly said in a statement. "You can see individual galaxies out there, but this star is at least 100 times farther away than the next individual star we can study, except for supernova explosions." According to a report published by the Space Telescope Science Institute, which operates the Hubble, the star is so far away its light has taken 9 billion years to reach Earth. Kelly said its nickname stuck because the star will appear to grow brighter and then eventually disappear like Icarus' waxed and feathered wings, which fell off when he got too close to the sun. The Icarus visible to us now is a very young star, Kelly said. Observers are seeing the star as it looked when the universe was about 30% of its current age. Discovery of the star began in 2014 when astronomers were using Hubble to study a galaxy cluster. Two years later, they were observing the cluster when they noticed a new point of light had appeared. The light turned out to be an individual star that only became visible with the help of gravitational lensing. Simply put, gravitational lensing is the concept that mass bends light. The mass in this case was a galaxy cluster about 5 billion light years from Earth, between our planet and Icarus. The cluster of galaxies act as a natural lens in space, bending and amplifying light while illuminating Icarus. "Being able to see one star at a time is helpful," Kelly said. Without gravitational lensing, the star would've been impossible to see, even with a powerful telescope, he said. Since the light from Icarus is 9 billion years old, Kelly said the star by now has likely been dead for billions of years. "We are looking back in time," he said. "As more objects move in front of (Icarus), we will be able to take a census of everything in the cluster." Kelly said they'll use the information to understand Icarus and gain a rare and detailed look into its evolution. In addition, in 2020 NASA will launch Hubble's successor, the James Webb Space Telescope, a more powerful observatory that will find other distant stars like this one.